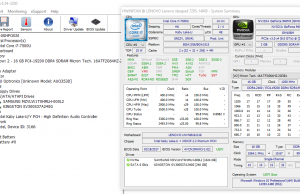 Summary: Lenovo did a great job here with the IdeaPad 720s. 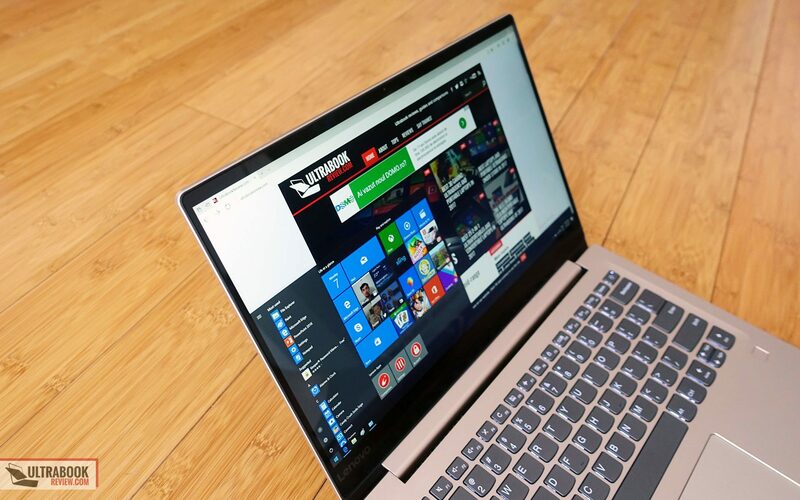 If you need a sturdily built laptop with very few compromises, good everyday performance and the ability to tackle games better than most thin-and-lights, this is one of your best options at the time of this article. Just make sure you're fine with the glossy non-touch display and the slightly heavier weight. Read on for all the in-depth impressions. 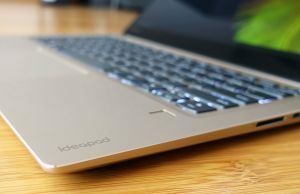 If you’re after a portable all-round laptop and you’ve got around $1000 / 1000 EUR to spend, the Lenovo IdeaPad 720s should be on your list. 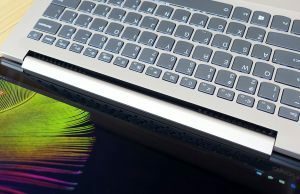 We’ve spent some time with it in the last weeks and gathered all our impressions below, with the good parts and its quirks, so by the end of the article you’ll know if this is the right computer for you or if you should turn your attention towards something else. 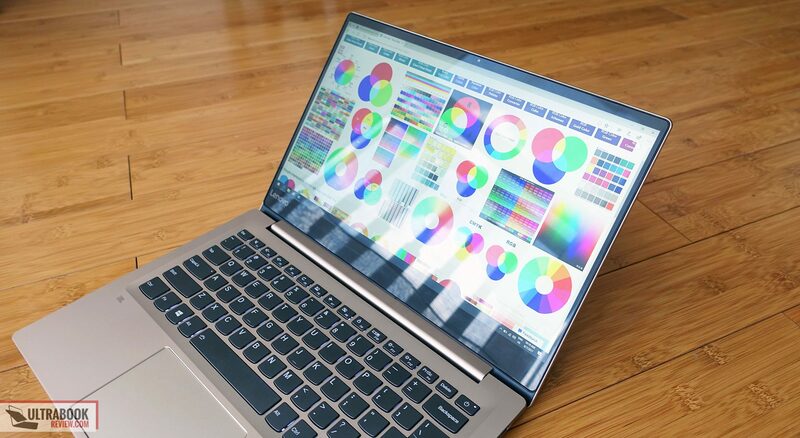 What you should know from the beginning is that this notebook is a thin-and-light option built on Intel Core U hardware and entry-level Nvidia dedicated graphics. That makes it capable of handling everyday tasks smoothly and most games at FHD resolution with Medium-High details, but it’s definitely not as fast as some of the beefier laptops you can get at this price point. It is however compact and portable, weighing about 3.3 lbs in the reviewed configuration and packing a 14-inch screen inside the body of a 13-inch laptop. It also doesn’t skim on the build quality, the keyboard, the IO or the battery, so overall there are very few compromises you’ll have to accept for the sake of portability . Among those are the high case temperatures and noisy fans in demanding loads, a glossy non-touch display and a rather slow wireless out-of-the-box. 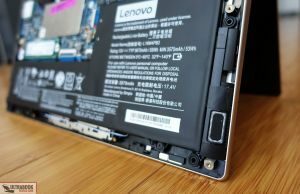 More about these and all the other aspects of the Lenovo IdeaPad 720s in the in-depth article below. Lenovo also offers an updated configuration with a quad-core Core i7-8550U processor and Nvidia MX150 graphics. It’s listed at $899 as of November 2017, making it one of the most affordable ultraportables with MX150 graphics. This laptop is very well made and you’ll immediately acknowledge that from the moment you get it out of the box. It just feels strong, with not flex or give in the lid cover and only a tiny amount in the keyboard deck, as it’s still not an unibody construction and gets a plastic inner chassis. But even so, I feel it can can stand next to the best of the best in terms of build quality. 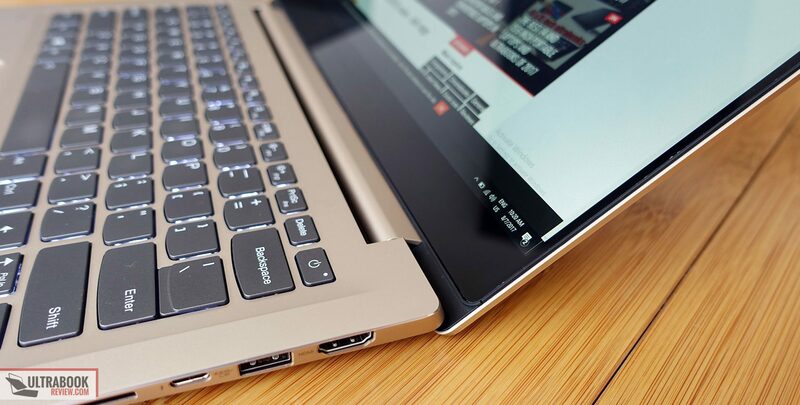 The entire exterior is made from smooth matte metal, the same finishing we’ve seen on many other Lenovo laptops. It feels great to the touch, doesn’t show any smudges on this color version and should age well. It also looks nice in a simple, non-obtrusive way. 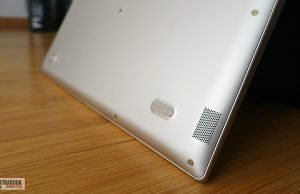 The few branding elements blend in with the casing, both the Lenovo logo on the hood and the subtle Lenovo, JBL and IdeaPad logos on the interior. 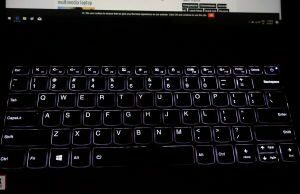 There are also no lights and flashy elements, except for the status LEDs on the left side and the slightly annoying power key that’s part of the actual keyboard and always lit on. All in all though this laptop would be a great pick for school and work environments with stricter design policies. There is however one aspect of the construction that I have to nitpick on: the edges are rather sharp, both the beveled ones around the interior, but especially the ones around the screen. 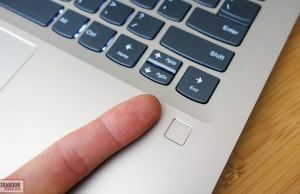 You’ll feel their bite when grabbing the laptop and when opening the screen. 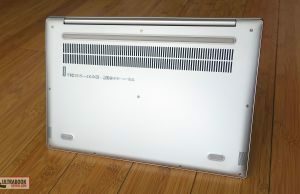 There are no other sharp bits though, not even on the underside where the back-panel attaches smoothly to the main-body, leaving no exposed dents like on some other laptops with a similar build. Down here you’ll notice the rubber feet, the speaker cuts and a large intake grill alongside the entire cooling system, with hot air being blown through some proper sized cuts behind the screen’s hinge. That’s a pretty standard approach for laptops like this one. 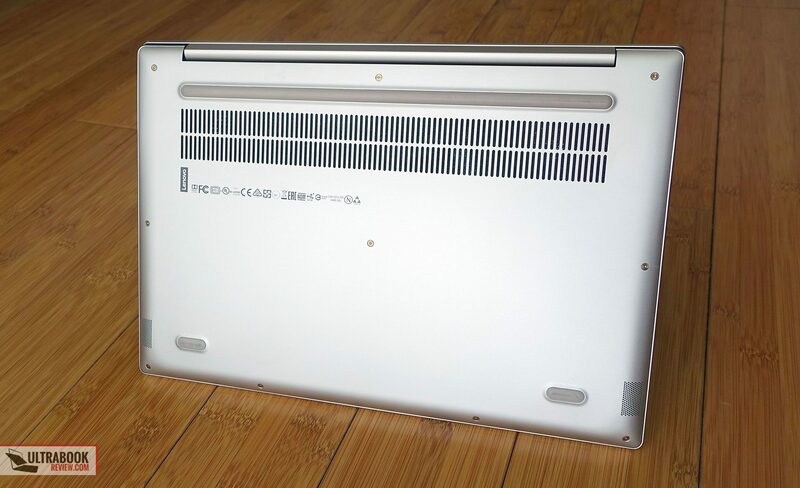 The IdeaPad 720s is a clamshell notebook. Its screen is hold in place by a fairly stubborn hinge that requires both hands to open, but otherwise keeps it well as set-up and allows it to lean back flat to 180 degrees. That’s an important aspect for those of us that don’t often use their laptops on a desk. And since we’re talking about using the laptop, I have to say that I had a good time with this IdeaPad. The sturdy metallic build and even the edges remind me remind me of my XPS 13, which is one of the best ultraportables out there. This one is a bit heavier, weighing in about 3.3 lbs in our reviewed configuration, but it’s still as compact as it can be, as you can tell from the narrow bezels around the 14-inch display. The display is however covered in glass and it lacks touch, which is a combo I’m not a fan off, as it adds unneeded glare outdoors and in brighter rooms without at least the benefit of touch. As far as the IO goes, there’s nothing missing here. 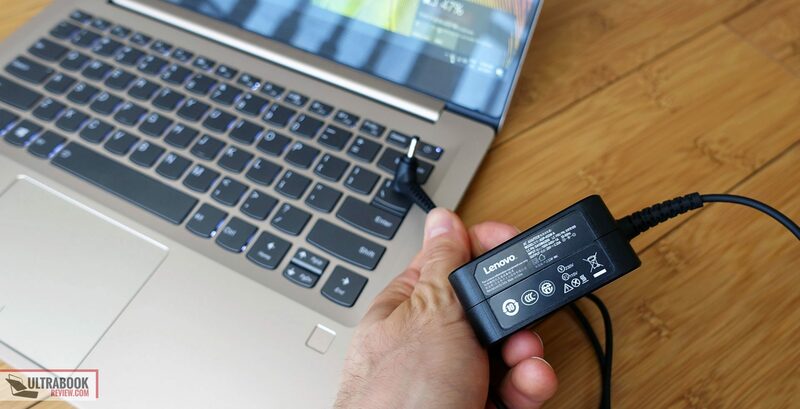 You get two USB Type A ports and an USB Type C connector with Thunderbolt 3, full-size HDMI, a card-reader and the headphone jack. That Thunderbolt 3 port is especially important, as very few other laptops with similar traits offer one. Lenovo advertises up to 40 Gbps speeds, but from what I can tell in HWinfo this is just a PCIe x2 connection, but do correct me if I’m wrong. 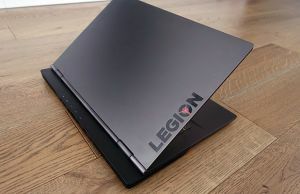 All in all, if it weren’t for the glossy non-touch screen, this would be one of my favorite 14-inch laptops available in stores right now, as it’s very well built, nice looking and fairly practical, with distinctive traits like a complete IO and a display that can go flat to 180 degrees. It is also a little heavier than the competition, but I could live with that and its somewhat sharp metallic edges. The glossy non-touch display though, this one is a deal-breaker for me. 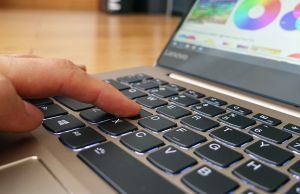 The keyboard and trackpad are just what Lenovo offers on most of their 13 and 14 inch IdeaPads and Yogas and most potential buyers will find them quite good. 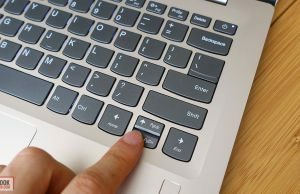 I for one found the keyboard a little bit soft and spongy, but after a few thousand words typed on it I can place it in the upper half in terms of the experience it provides. 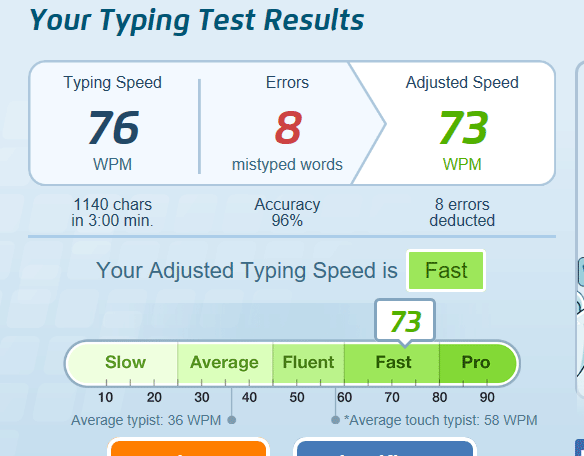 I was able to type in fast and mostly accurately, with occasional mistakes caused by the fact that the keys put too little resistance and it’s easy to press something else while floating your fingers across. The stroke is pretty short too, but that’s a given with ultraportables these days. 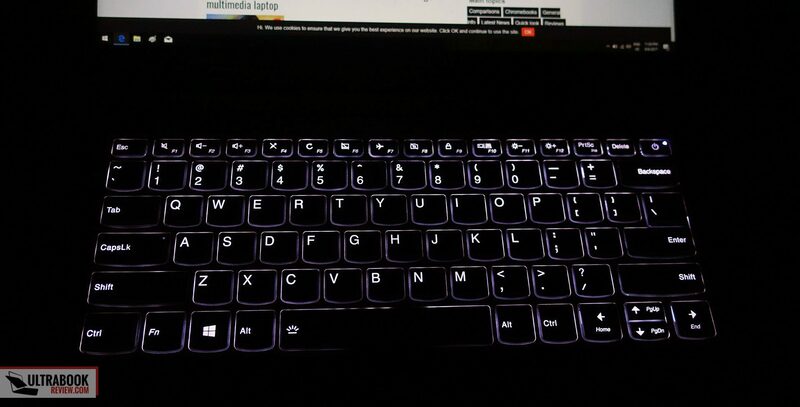 This keyboard is also quiet to type on and backlit, with two brightness levels to choose from. 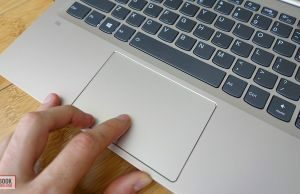 The illumination system is activated when swiping your fingers across the touchpad, or by hitting a key. 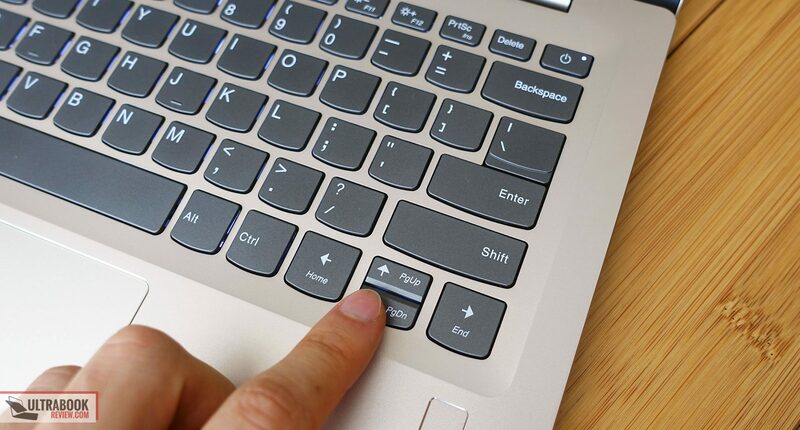 The layout is mostly fine, but the fact that the Up and Down arrow keys are so short needs time to get used to. There’s also the fact that the “Enter” and “\” are bound together, which is a little odd, but a convenient way to accommodate different layouts on the same interior design. 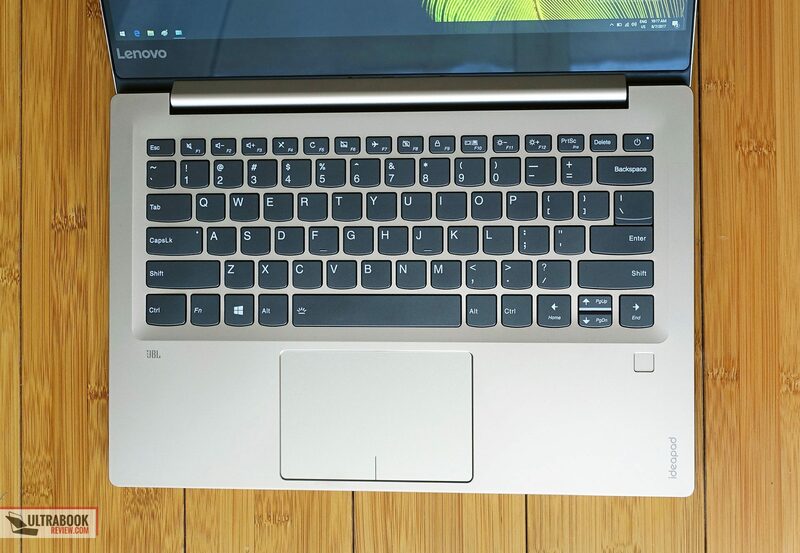 For mouse Lenovo went with a large Synaptics clickpad, slightly lowered into the frame and separated from the palm-rest by a beveled edge. 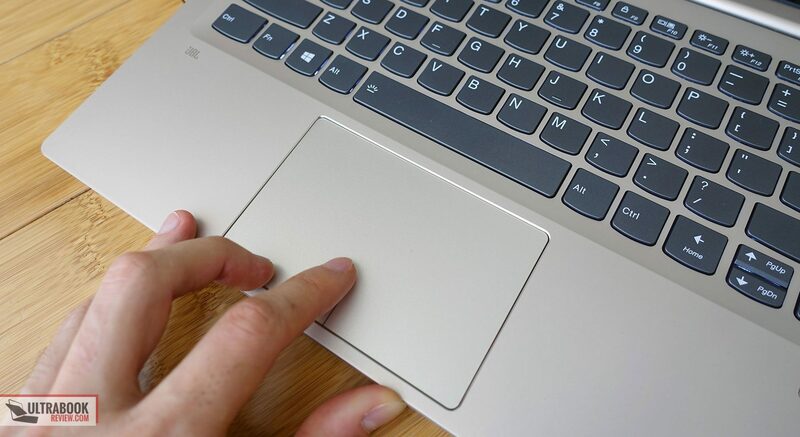 It has a nice feel to it and allows the fingers to glide easily on its surface, although it’s perhaps not as fast as some of the glass clickpads out there. Overall though I don’t really have much to complain about its performance and feel. It handles swipes, taps and gestures smoothly and consistently, with no jerkiness or stuttering, and it also came well calibrated out of the box and I didn’t had to tweak its behavior in any way whatsoever. 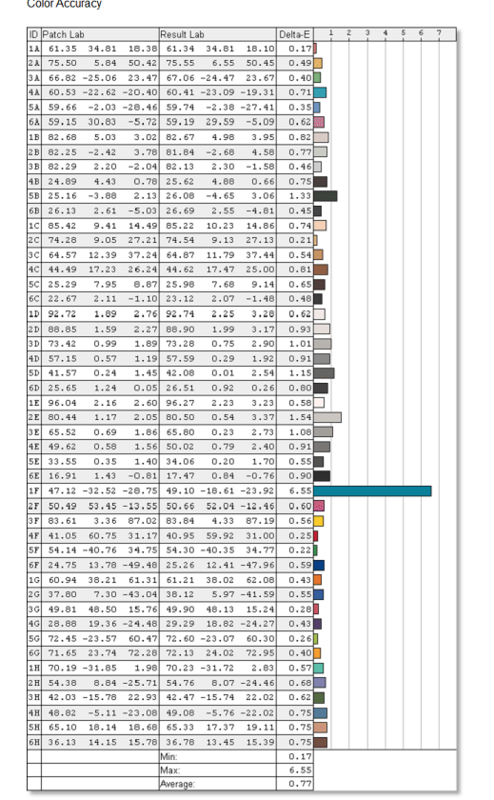 The physical clicks are in the lower left and right corners and they’re fairly smooth and quiet. 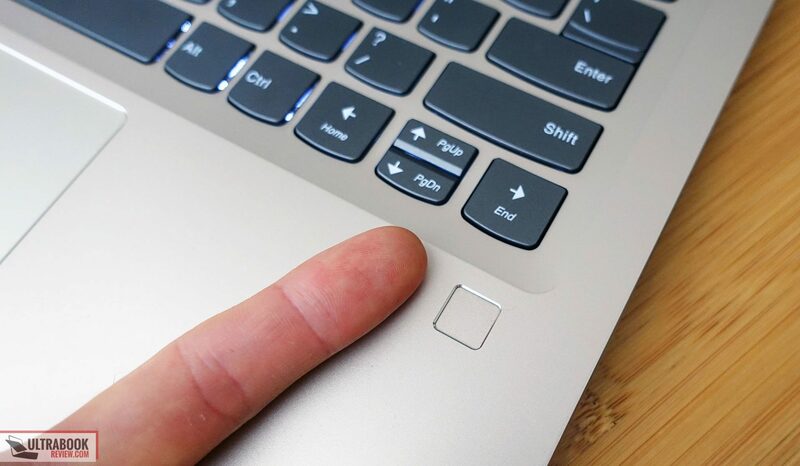 Lenovo also integrates a finger sensor in the right-side of the palm-rest, beneath the arrow keys, which works well with Windows Hello. I mentioned earlier than the Lenovo IdeaPad 720s gets a glossy non-touch screen with a pretty good 14-inch IPS panel beneath a protective layer of glass. I’m definitely not a fan of this approach that adds unneeded glare and reflections in bright environments, but as long as you’re going to keep this mostly indoors and in dimmer rooms, you might actually appreciate the stronger build and the lack of that specific graininess associated with matte panels. Lenovo went with a FHD 14-inch panel made by AU Optronics, a pretty solid option that’s also available in a bunch of other mid-tier laptops like the Acer Spin 5 and Spin 7, or the Asus Pro B9440. You’ll find more details below, taken with a Spyder 4 Sensor. 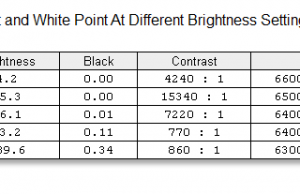 Black on max brightness: 0.34 cd/m2. 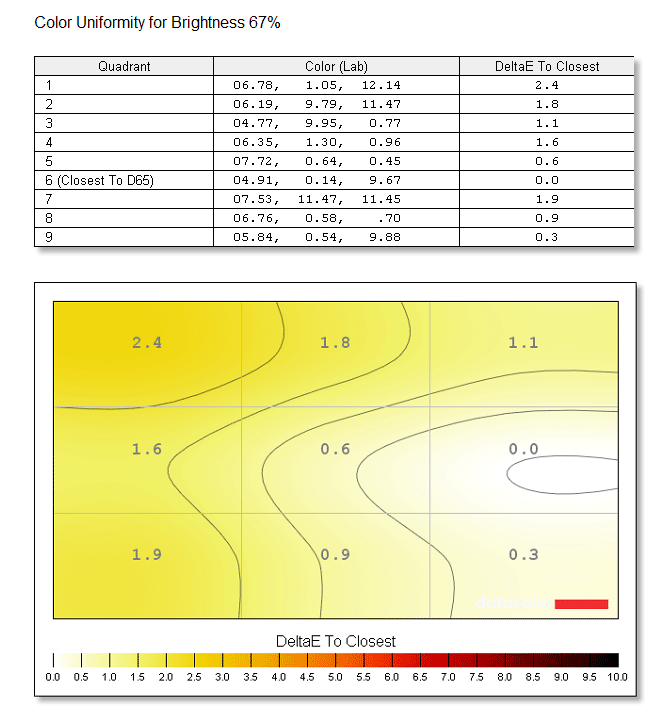 Aside from the fact that the colors, gray levels and gamma are a bit skewed out of the box, which you can mostly address by calibrating the panel or using our calibrated color profile, there’s a lot to like about this screen. I haven’t noticed any obvious light bleeding around the edges either, but one thing that I found quite odd is that you have to cram the brightness to at least 70% to get to 120 nits, which is what I find adequate for indoor use in my office. Not an issue, just and oddity I noticed. 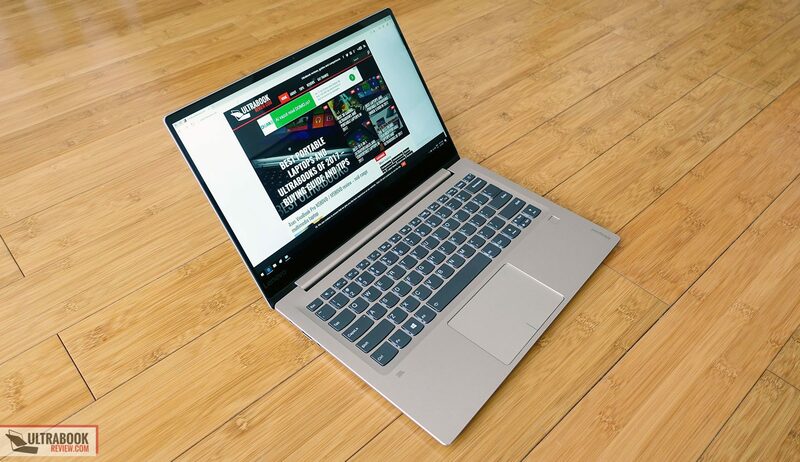 Lenovo offers the IdeaPad 720S in a bunch of different configurations and we got to test the highest one available, with an Intel Core i7-7500U processor, 16 GB of RAM, a 1 TB NVMe SSD and Nvidia GTX 940MX graphics with 2 GB of GDDR5 memory. 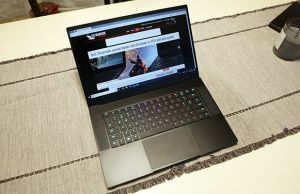 The Nvidia chip makes this a fairly capable gaming ultraportable, as it’s the improved version with GDDR5 memory and not the GDDR3 model available on the Asus Zenbook UX430UX and a few other laptops in this class. 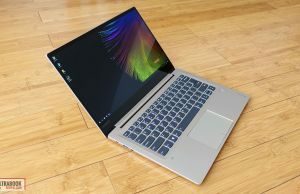 It’s still not a match for the newer devices with Nvidia MX150 graphics like the new Acer Aspire Swift 14 and the Asus Zenbook UX430UN though, as you’ll find out from this dedicated post about the Nvidia MX150 chip. 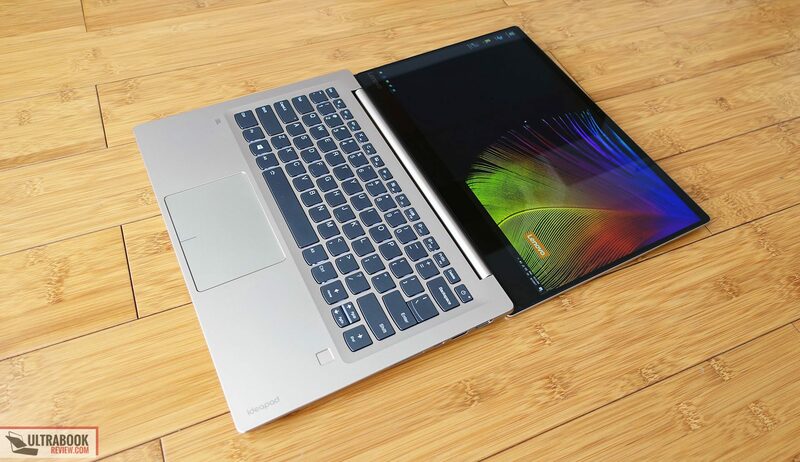 For now I can’t tell whether Lenovo plans to update the 720s to MX150 at some point, but I’d reckon it will happen. As far as the hardware goes, the CPU and GPU are soldered on the motherboard, but you can get inside to access the RAM and M.2 SSD, as well as the wireless chip and the battery if needed. For that you’ll need to get past the back panel, which is a simple task as it’s only hold in place by a few Torx T5 screws, all clearly visible. Keep in mind that the RAM slot is placed beneath an aluminum shield that you’ll have to remove by loosening the pins that hold it in place. Before we jump to high load and gaming performance I should also mention that this laptop can handle everyday tasks smoothly, while running cool and fairly quiet. 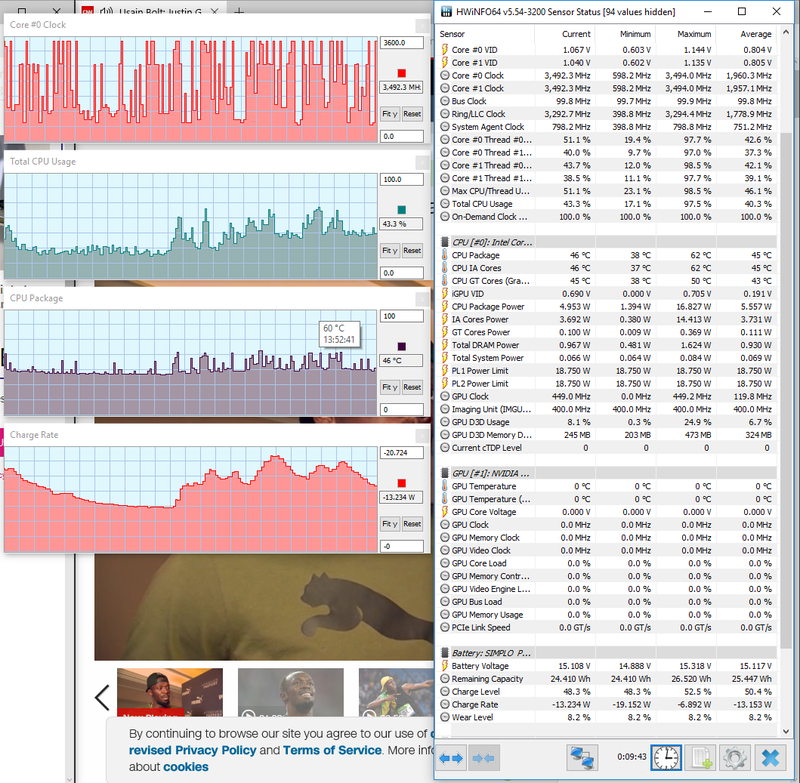 The pictures below show details on speed and temperatures with browsing, typing and watching multimedia content. Things change a bit with demanding loads, but you should take our findings with a grain of salt as we’re testing an early sample of the IdeaPad 720s and things might change with newer drivers and software updates on the retail models. Our review unit struggled to maintain full CPU and GPU Turbo speeds in benchmarks, demanding loads and games (details in the pictures below) and that’s why some of the results below are lower than what the hardware platform is capable of. 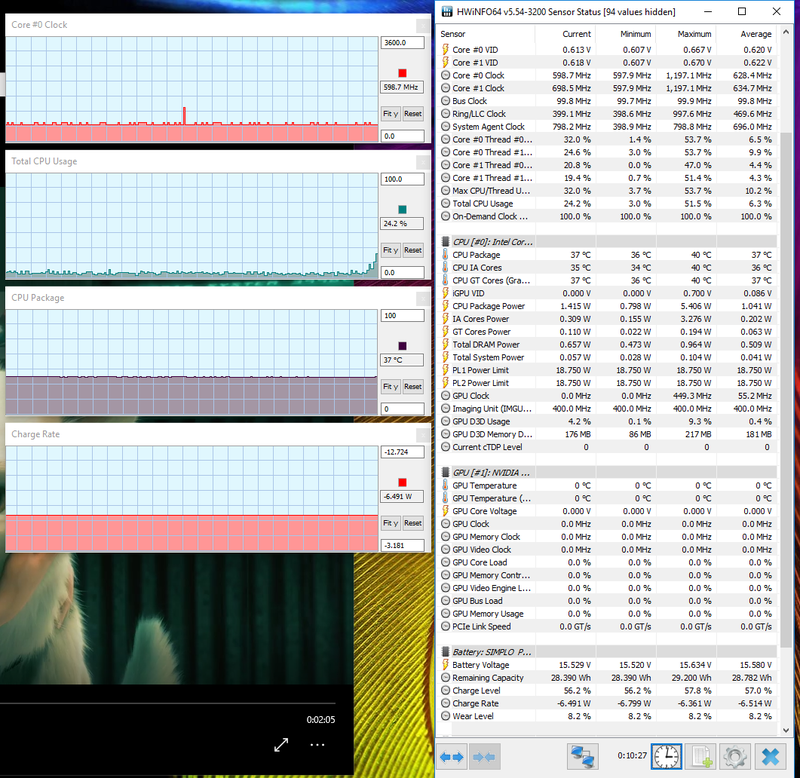 x264 HD Benchmark 4.0 32-bit: Pass 1 – 98.77 fps, Pass 2 – 19.08 fps. For comparison, the Asus Vivobook S510UQ gets the exact same hardware platform and manages 5-10% higher scores in multitasking and graphics tests, while the Zenbook UX430UQ scores higher in CPU tests and lower in GPU tests, because it squeezes more from the Core i7-7500U processor, but only gets the slower GDDR3 version of the Nvidia 940MX chip. As far as gaming goes, here’s what we got on our test unit. 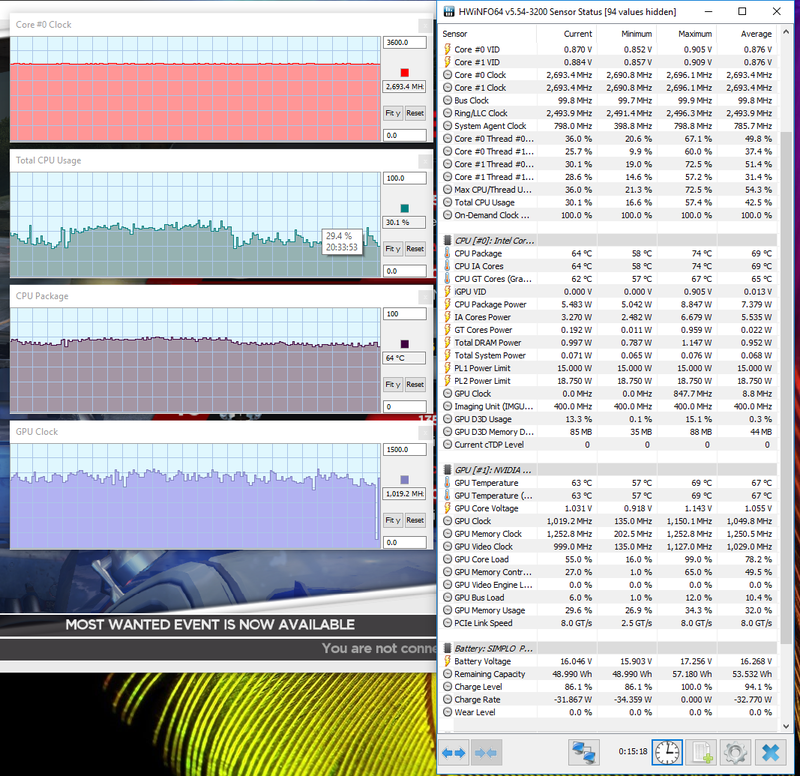 The fact that the GPU cannot even maintain its default speed of 1.088 GHz and only averages .900 to .950 GHz in prolonged sessions takes a toll on performance, but even so the 940MX with GDDR5 memory is at least a 20% bump from the GDDR3 940MX used on the Zenbook UX430UQ and at least twice faster than the Intel HD 620 chip integrated within the CPU. Final retail units should show improvements over what we got in our tests, as the mid 60s temperatures on the CPU and GPU in games leave plenty of headroom for Lenovo to optimize performance in their final products. 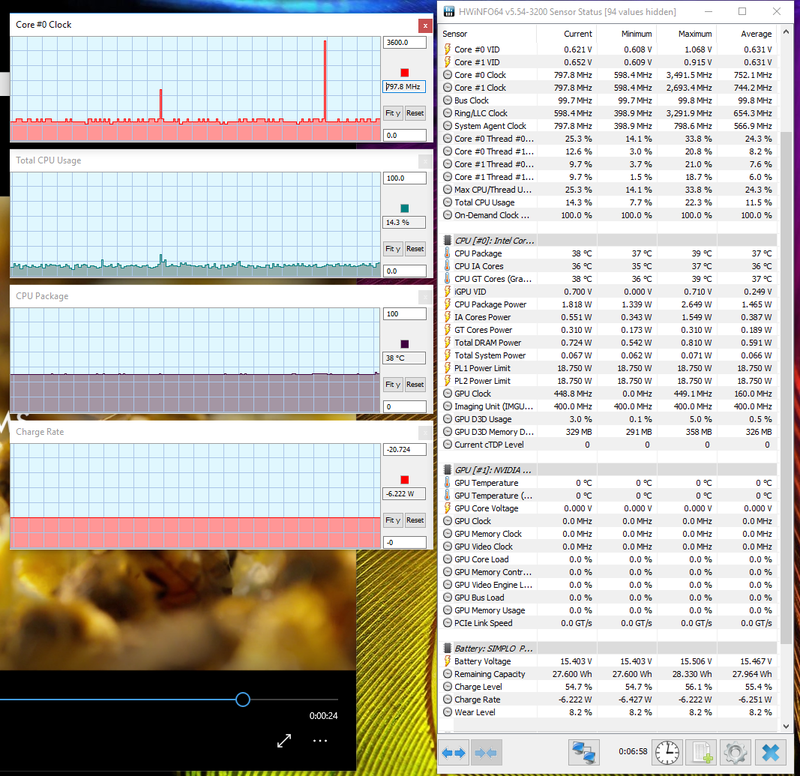 I also find it weird that the results above are better than what we got on the VivoBook S510, despite the fact that the GPU ran at ~1.2 GHz on that one and significantly slower here. All in all though, if you’re after the best gaming abilities in a thin and affordable package I must once more stress that your money would be best spent on some of the Nvidia MX150 notebooks right now. 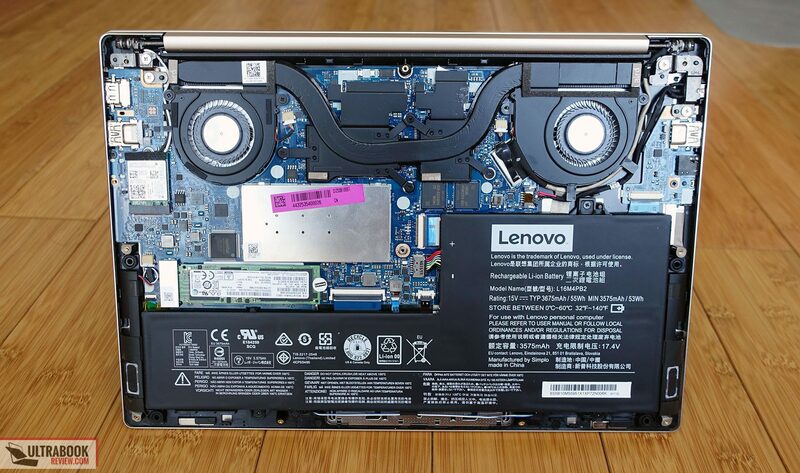 There are two fans inside the Lenovo IdeaPad 720s, with a minimalist cooling system with just one heatpipe that spreads on top both the CPU and the GPU. The large intake on the bottom and proper output grills sure help though. The two fans are not individually controlled and spin at the same time. They remain inactive with very basic activities, like watching a movie, but kick in with the slightest traces of multitasking or the moment you launch Chrome. They’re usually fairly quiet and barely noticeable even in a completely silent room, but they do occasionally ramp up for a little while and then quiet back down, and then ramp up again and so on. 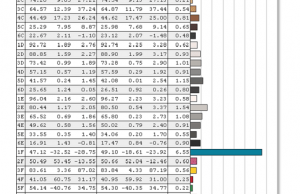 I measured noise levels of around 38 dB at head level with everyday multitasking, with a base room noise level of 33 dB. 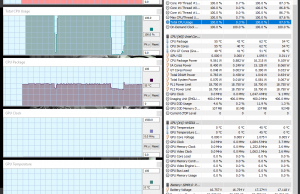 There’s no coil whining or electrical noise, so overall this laptop runs quiet and cool with daily use. 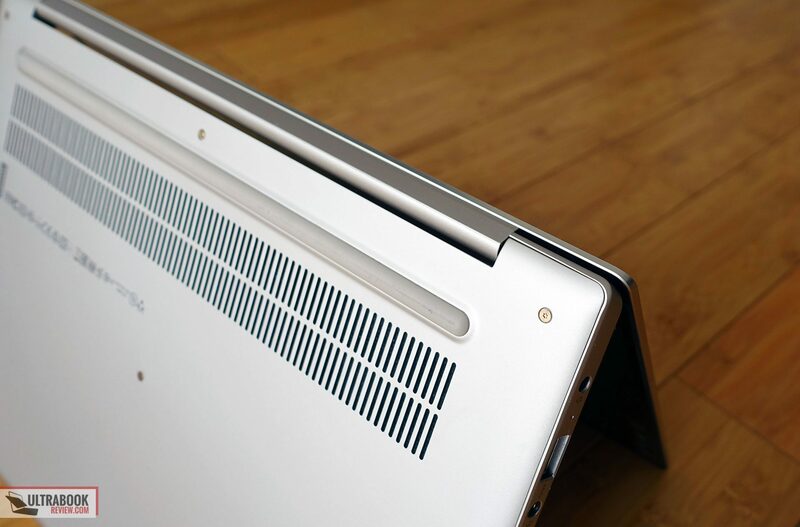 The fans ramp up with games and the outer case gets above mid 40s in certain spots, which is uncomfortable for gaming on the lap, but otherwise normal for a laptop with this kind of waist and hardware inside. 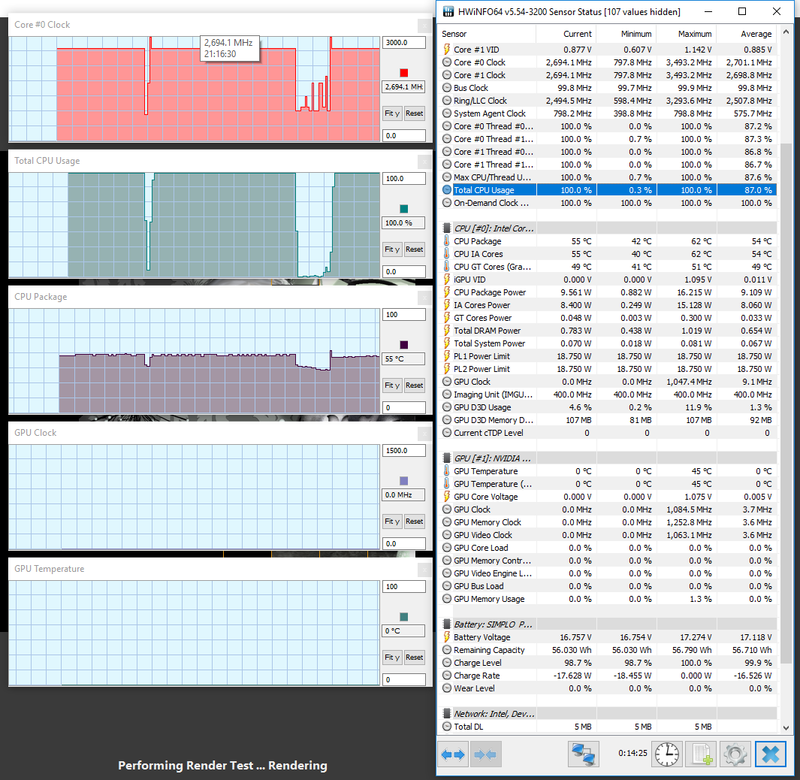 The fans can get a little loud at this point though, at up to 45-46 dB at head level, somewhat noisier than on the Zenbook UX430UQ that only averaged 43-44 dB, but on par with most other devices in the class. For radios Lenovo went with Wireless AC and Bluetooth. 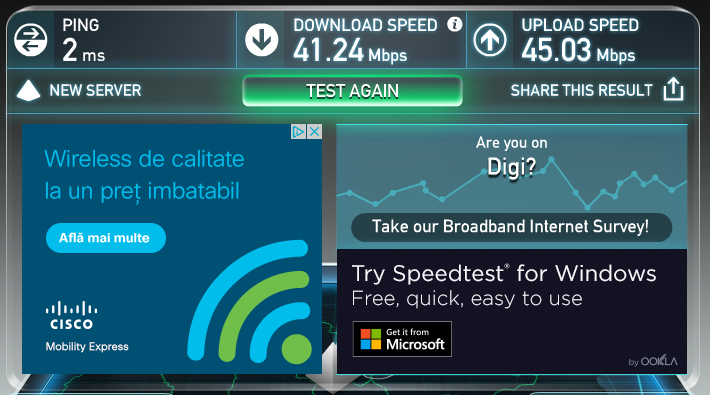 Unfortunately they included the lower-end and rather slow Intel 3165 chip on this laptop, so as a result the review unit would only get up to 50 Mbps speeds in everyday use, even when close to the router. 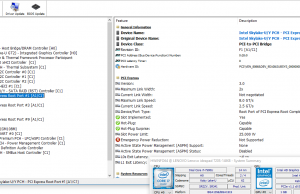 The wireless chip can be easily replaced with one of the newer Intel options if you want to. There’s a service manual here that should help. On the other hand the wireless antennae do a decent job at longer ranges, the laptop being perfectly usable and 30 feet with 2 walls in between, with no obvious buffering or any drops. Update: As of early December 2017, it looks like the retail versions of the IdeaPad 720s sell with a much better Intel AC 8265 wireless module in most parts of the world. 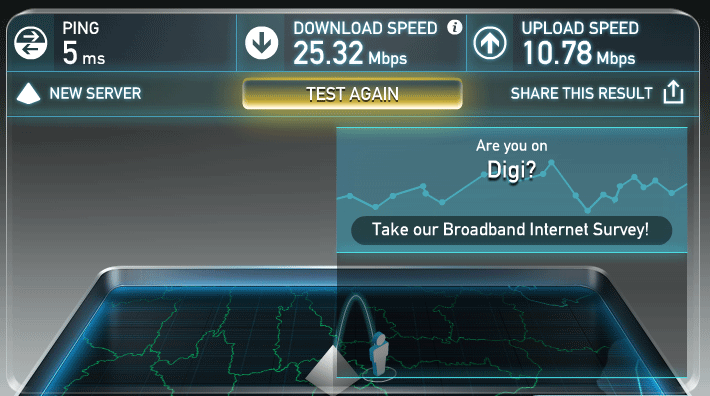 That translates in superior Wi-Fi performance and negates the need to swap the Wi-Fi chip yourselves. There’s a set of stereo speakers branded by JBL on this laptop and they’re decent, but not impressive in any way. We measured maximum volumes of about 74 dB at head level, and while the sound is clean and without distortions, is not very rich. 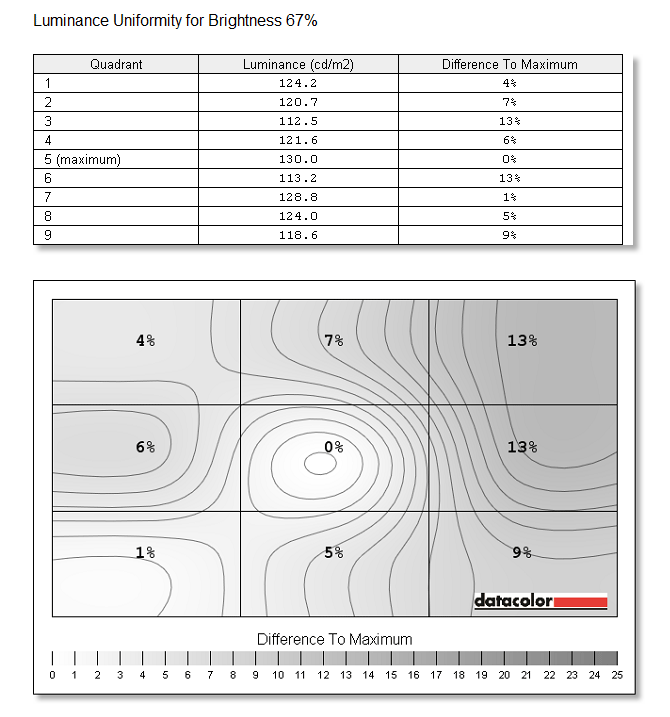 Low end is identifiable from 95 Hz and up in some of the Youtube tests I tried. 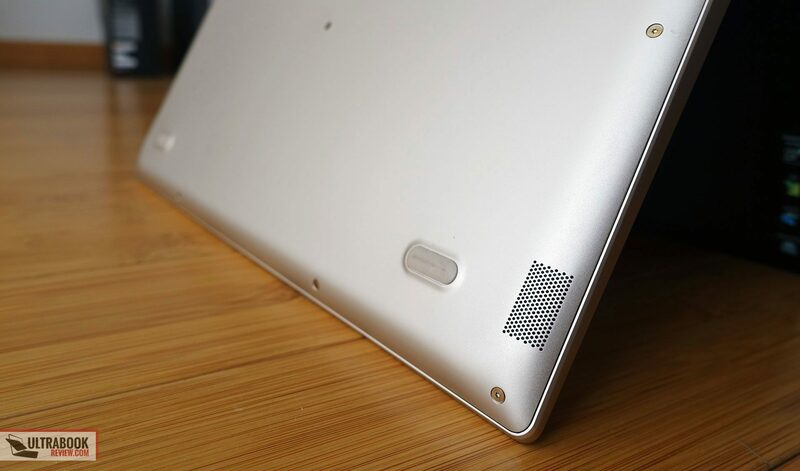 I should also mention that the speakers are placed on the bottom and their cuts are small and easy to muffle when using this laptop on the lap or on any other surface that covers them, so you might want to pay attention to that if you care about audio quality. 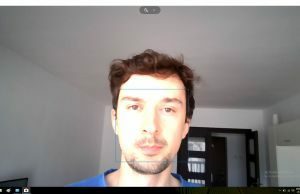 As far as the webcam goes, well, it’s an HD camera placed on top of the screen and is pretty bad, grainy in poor light and with a tendency to greatly overexpose in good light, as you can see above. The mics are placed beneath the screen, just on top of the hinge, and that’s why they have a hard time cancelling out typing noises. Lenovo puts a 56 Wh battery inside the IdeaPad 720s, which is a little bigger than on most other 14-inch laptops with similar traits. Combined with a FHD screen, this laptop can last for quite a while on a charge. We set the screen’s brightness at around 120 nits, which in this case was 70% brightness. 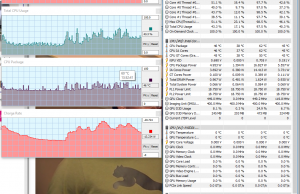 34 W (~1 h 30 min of use) – Gaming on battery, High performance Mode, screen at 70%, Wi-Fi ON. 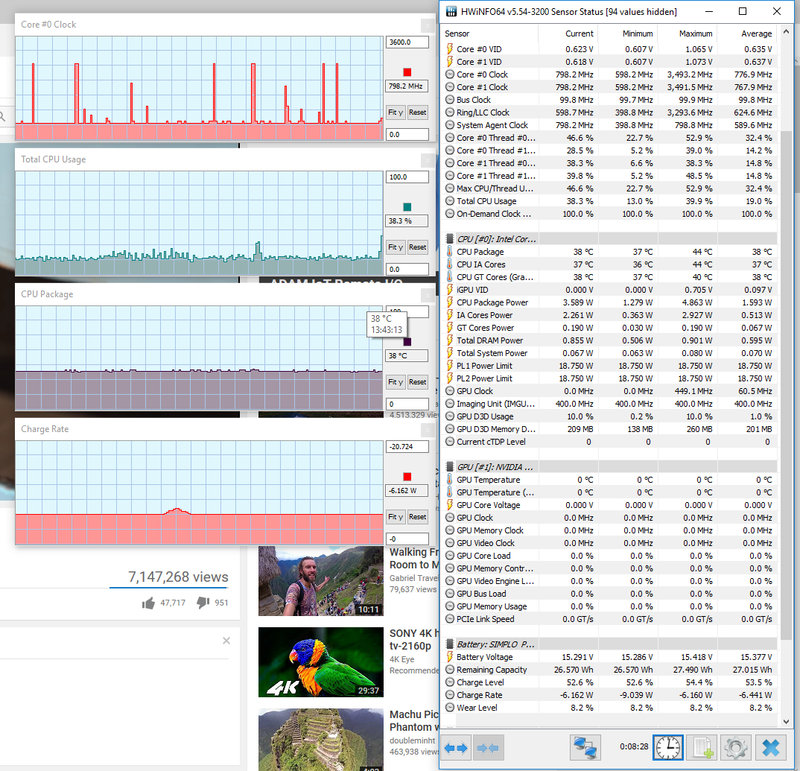 I’ve seen other reviews complaining about battery life on this laptop and based on the numbers above our sample is more aggressive than other laptops with Core U hardware and a FHD screen, but the bigger battery compensates and thus 4-5 hours of real-life daily use and 8-10 of video are not bad for this class if you ask me. The charger provided in the package is compact and light, but also surprisingly small at just 45 Wh. The battery takes at least 2h and 15 min to fully charge, and longer if you’re playing games during this time. The IdeaPad 720s is available in most regions of the world as of August 2017. In the US Lenovo offers a mid-range configuration with the Core i5 processor, 8 GB of RAM, a 256 GB PCIe SSD and the Nvidia 940MX graphics chip for under $900, which is pretty solid pricing for what you’re getting. 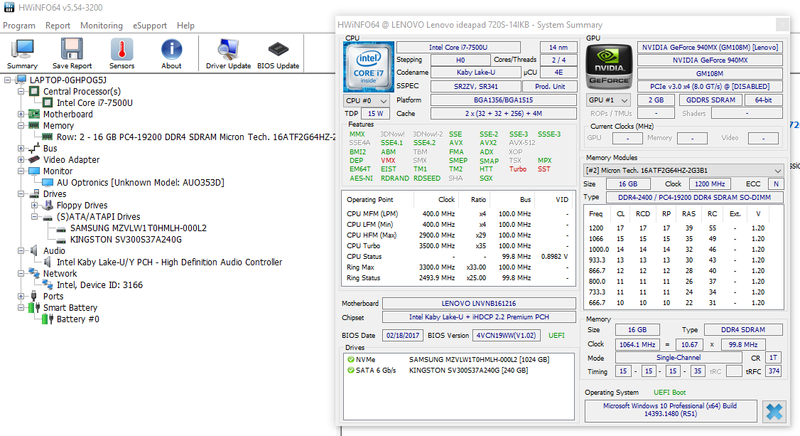 There’s also a similar configuration, but with a Core i7 processor, for $950 on Lenovo’s website. Higher end configurations get a Core i7 processor, up to 16 GB of RAM and larger SSDs. As of November 2017 the IdeaPad 720s is also available with quad-core KabyLake-R processors and Nvidia MX150 graphics. This configuration is listed at around $900 in the US, with 8 GB of RAM and a 256 GB SSD. Follow this link for more details and updated configurations and prices at the time you read this article. This laptop is really interesting and unlike other laptop with similar traits, is actually available in most regions as of August 2017. The build, hardware and overall good value for the money put it on the map. 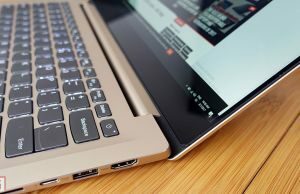 Lenovo didn’t skim on the craftsmanship, the keyboard/trackpad or the IO, while inside they put the most recent hardware available at the moment, leaving room for upgrades, and a pretty big battery. The Nvidia 940MX chip is also a fair performer as it’s the improved GDDR5 version, but those of you interested in gaming on an ultraportable should primarily turn their attention on the Nvidia MX150 configurations. Right now there aren’t many of those available though, so if you need to buy something this Back to School season, the 940MX is your best bet. 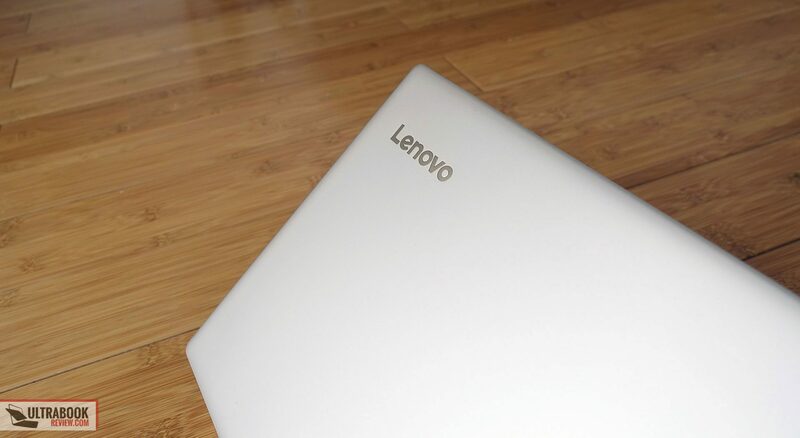 On the other hand, there are two main aspects Lenovo should have done differently here imo. One is the glossy non-touch display. 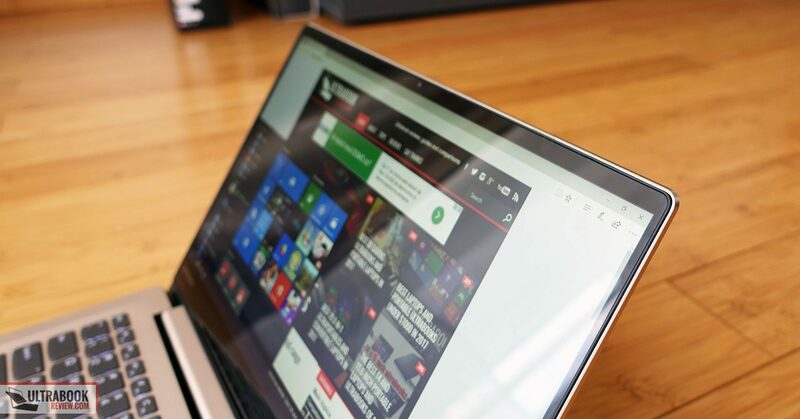 It’s a pretty good one with a decent IPS panel, but the glare corroborated with average brightness make it a tough sell for those that plan to use the laptop outdoors, and that’s why I would have preferred a standard matte screen. The other is the slow Wireless chip that comes bundled (or at least came on our sample), but this one can be easily replaced with a faster model if needed. 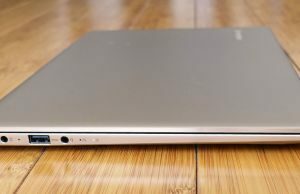 And if we’re on this topic, I will also add that this IdeaPad is a little heavier than the competition and fairly noisy/hot in demanding loads. 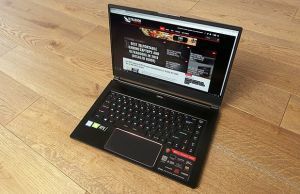 The high temperatures are just the norm with this kind of hardware and form factor, but other laptops run a little quieter in games and heavy use. We also ran into some performance issues on this particular sample, with both the CPU and GPU not at their best in demanding loads, but you should take this with a grain of salt and read other opinions, as our sample was a pre-release model and not a final retail unit. 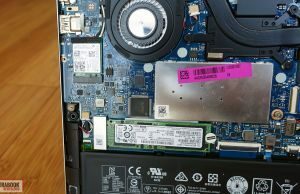 And even so, while discrepancies were noticeable in hardware logs, they didn’t have a significant impact on the laptop’s performance in actual use. 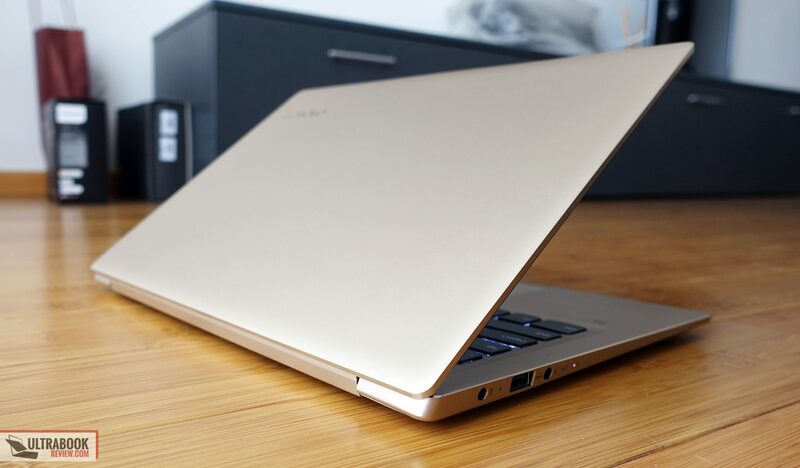 As far as competition goes, the Asus Zenbook UX410UQ is the closest rival available right now, but this one doesn’t sell worldwide. It’s available in Europe and gets a proper matte screen, but on the other hand there’s a smaller battery inside and no Thunderbolt 3 port. More details in our in-depth review. 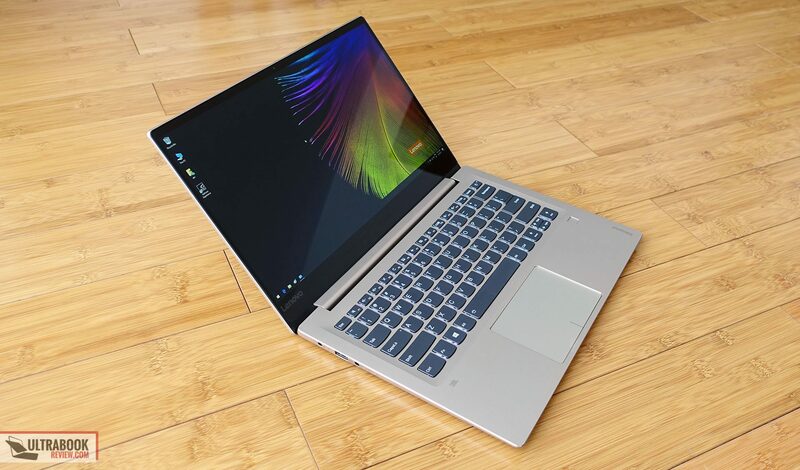 There’s also the more expensive and more portable Zenbook UX430UQ to consider, but both of these only get Nvidia 940MX chips with GDDR3 memory, so are about 15-20% slower in games. If you don’t need the dedicated graphics there area a few other well priced compact 14-inchers you should check out, like the Acer Swift 3 or the Asus Pro B9440. 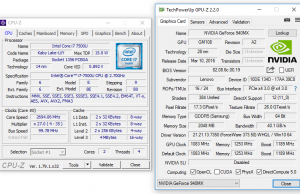 But if graphics performance is crucial, I’ll once again stress that you should turn your attention towards devices like the Asus Zenbook UX430UN, Acer Swift 3 2nd gen and other ultraportables with Nvidia MX150 graphics. 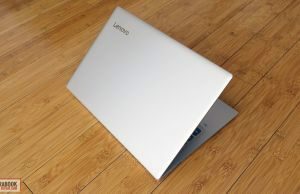 All in all, Lenovo did a great job here with the IdeaPad 720s. 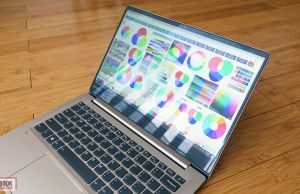 If you need a sturdily built laptop with very few compromises, good everyday performance and the ability to tackle games better than most thin-and-lights, this should be on the map. Just make sure you’re fine with the glossy display and preferably replace that Wi-Fi chip to get better wireless performance. With that in mind we’ll wrap this up here, but the comments section below is open for your feedback, impressions and questions, and we’re around to help out if we can. 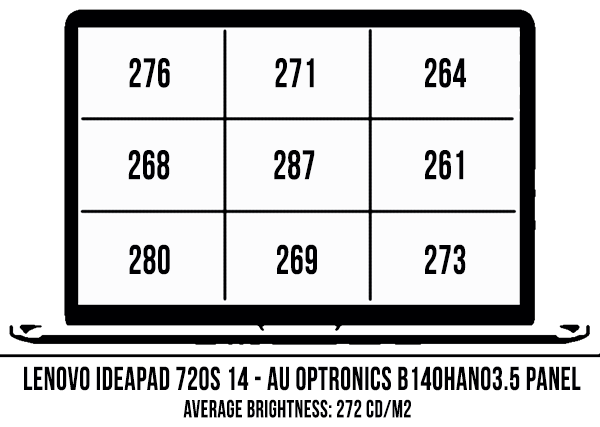 You have a misprint, "For mouse Asus went with a large Synaptics clickpad, "
Great review on the 720s and 320s! Will we see one for 520s soon? I can't tell right now, but that's not impossible. Wont' happen in the next 2-3 weeks though, I have other things in the works. Nice review. I was looking for a budget laptop capable of light gaming, 1080p video editing, and good video streaming battery life. 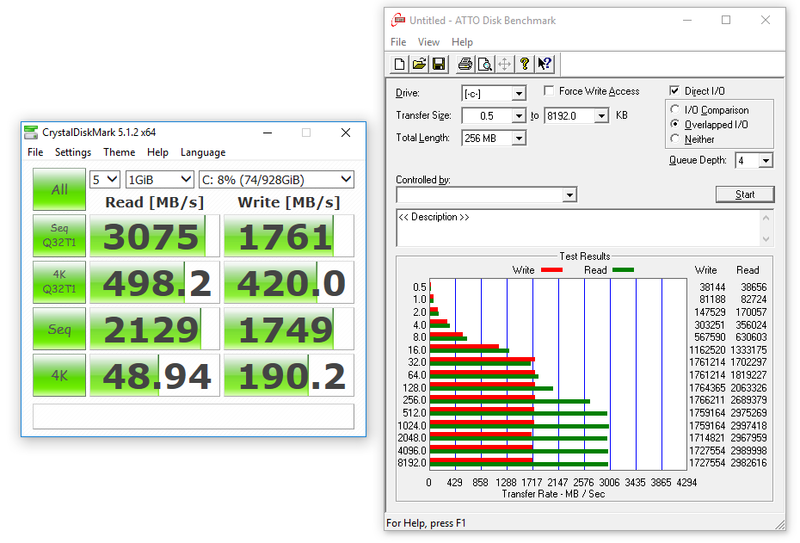 Initially looked at the Asus UX430UN but was disappointed by SATA 3 SSD limit, small battery and high price. Finally narrowed my choices to this or the new HP Envy, but it looks like Lenovo's also raising prices of the mid-range 7×0 lineup. Like the 720s, the Envy 13 has improved battery capacity since last gen but it sports the MX150 pascal dGPU. It doesn't have a TB3 port, but it does have NVMe SSD support, which is essential for video editing. I hope you get to review it soon. 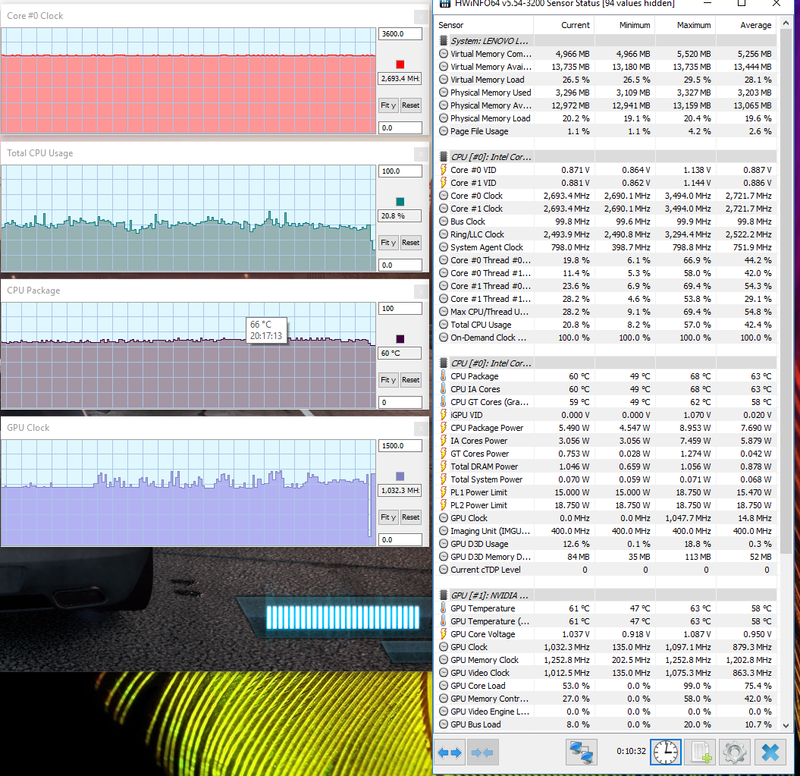 The UX430 support PCIe x4 SSDs, not at full speed, but you'd still get close to 2 GBs read speeds. About the Envy, HP laptops are hardly available in my region and I haven't' reviewed their devices in a while, so the chances are slim to none that's I'll be able to review that one. That thudnerbolt 3 thing is right. 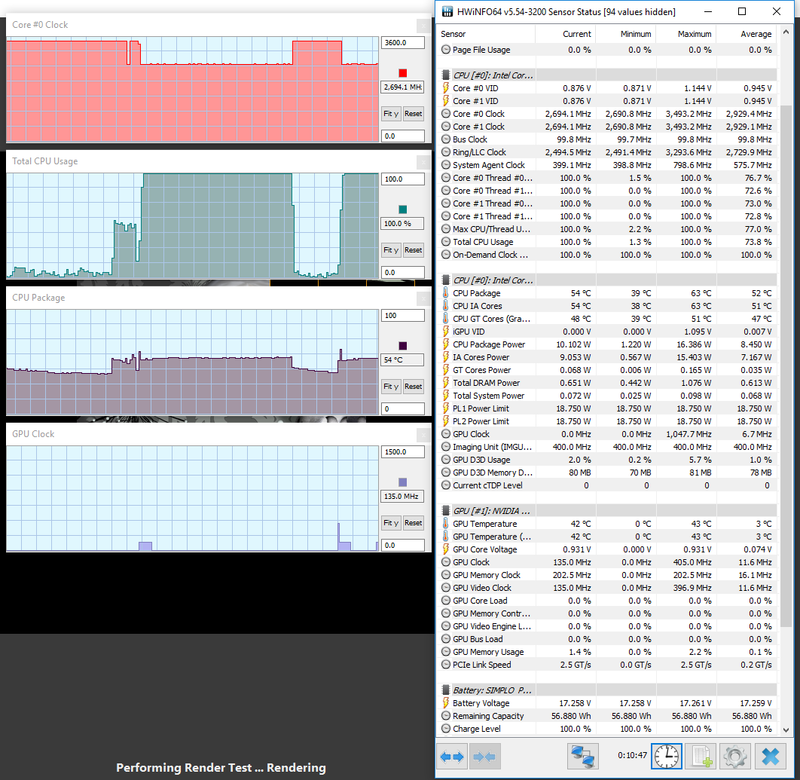 As there is a low power Thunderbolt 3 (JHL6240) using only 2x PCIe 3.0 links and therefore it is only 20Gb/s. There's also more notebooks like this, where they claim it has TB3, but they will hide the fact that it is only half the speed or they say it "speeds may vary". This would be a concern if I want to put an eGPU trough an adapter (like Razer core or similar)? If no, maybe you can recommend one of this cases and a proper GPU to work with this laptop. Would you say the screen quality on the 720s iw worse or similar to the Acer Swift 3 with mx150 graphics? Looking to buy one of these and the graphics chip is important however not as important as a really poor quality screen. Hi, it's much better. 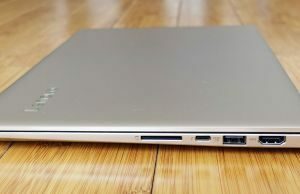 See here: https://www.ultrabookreview.com/17425-lenovo-ideapad-720s-review/#a4 and here: https://www.ultrabookreview.com/16888-acer-swift-3-sf314-52-review/#a4 . The Swift gets one of the lower tier IPS panels, while the one on the 720S is above average. Now, whether you'll actually be able to easily tell the difference between them in actual use is rather subjective and depends on what kind of screens you'd experienced in the past. Both would look alright to the untrained eye if you ask me, but the one on the 720s is richer, brighter and just nicer overall. Not on this sample, or at least not the the point that it would bother me. I would have mentioned it otherwise, as that's something I find annoying as well. Thanks for some amazing reviews, I love to read them. But I need some help. 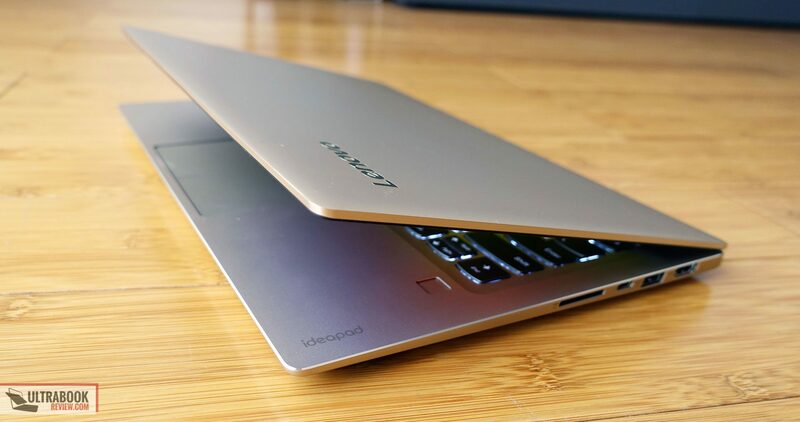 I am looking at a new study laptop and I have looked at the Lenovo IdeaPad 720s-14 "80XC0010MX" and ASUS ZenBook UX430UQ-PURE2. But I can not decide which one it should be, as there are pros and cons for both of them. I need it for study, light gaming and image editing. Have stumbled blind by looking at them for a week now. Which one should I choose ??? Personally I'd choose the Asus for the matte screen, but they are very similar. Is there a price difference between them? I also like the screen on the Asus. But no, there is no price difference between the two devices. Do you have an idea when the MX150 version would be released? Because I've also looked at the UX430UN. I have also found a UX410UQ GV034T for the same price? No, unfortunately. However, if you're living in one of the Northern European countries (based on your name), I'd reckon you'd be among the first to get it, based on the availability of previous Zenbooks. Could try to get in touch with Asus on your country via Social media and see if they can share any helpful info. You're right, I'm from Denmark :) I've talked with Asus and they expect that it is released in early Q4 of the year, so maybe October. I just find it hard to wait as it is for studio use. But I have found a UX410UQ GV034T, at the same price as UX430UQ-PURE2. I like how the UX430 model feels but I can not find any stores to try the UX410. Does it feel very awful compared to the UX430 or is it an okay purchase? It's a big bigger/heavier, the metal feels a little cheaper and the build is a tad more flimsy. It's still a pretty good laptop though. I've seen some people claiming the UX410 comes with a plastic main-body in some regions, mine came with a metallic interior though, and only the underside was plastic. Hey Andrei, I was planning to buy this laptop, but the slow wireless card is a problem. Are you sure it can be replaced with the newer Intel 8265? Because I read somewhere that this laptop has a 1×1 antenna and the 8265 requires 2×2. I don't know to be frank, I didn't actually consider this aspect. Nor sure how the 8265 works on a 1×1 antenna setup, that's a bit out of my league, so I'd rather not say anything that would be wrong. Sry I can't be of any help here. I'll update the post, thanks. Would be nice if you could implement thunderbolt 3 testing in your reviews somehow. 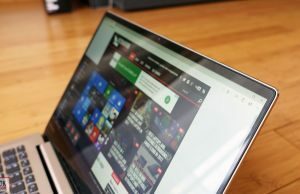 Like a 4k screen, I've read about some laptops that can only run external displays on integrated graphics, does optimus make a difference and so on. Maybe some high speed external storage peripherals also. Thank you. Noted, thanks. I don't have a 4K screen, I use a 21:9 3440 x 1440 px monitor, and I don't have any TB3 peripherals right now, but I'll check out what I need and consider it for the near future. Nice review! I was wondering what your thinking is on physical battery capacity vs. tested run times. 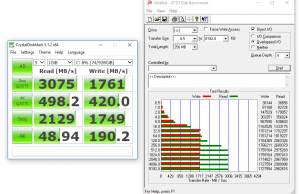 You mentioned the larger capacity of the 720s as a benefit over the Asus ux410 even though the battery test results were roughly equivalen–and with a slight edge to the Asus in light browsing and youtube playback. 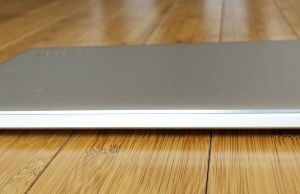 Do you feel that in such a case, the larger capacity battery may hold up better over the life of the laptop or that it may prove superior in real life scenarios beyond your tests? Software optimization matters as well with battery life, I'd reckon that's the main reason why the two are mostly on par. As far as your question goes, batteries wear out in time and of course the more you start of, the more you'll be left with. However, there's also a big amount of luck involved in this matter, so there's always the possibility your battery would loose a chunk of its capacity out of the blue and no way to tell for sure which is going to do have a bigger capacity left after a year or more. Take my XPS for instance, it lost almost 8 Wh (if I remember correctly) in two occasions in the first months when I got it, and just 2 more W ever since, in more than 2.5 years. The battery on my Thinkpad also died completely out the blue one day, despite the fact that I carefully used and maintained it and was at 98% capacity after about 2 years of use. The batteries on other laptops that I own still work fine with 5-7 years under their belt. I try to minimize the chance of failure by not allowing the battery to go under 10% and usually not charging it past 98%, I can set this in BIOS on the XPS and the ThinkPad, but at the end of the day batteries are consumables and there's a good reason why they only get 6-12 month warranty. Luckily they're fairly easy to replace though. Thanks for the tip on charging to 98%, that sounds much more practical than the 80% recommendation I've seen from some battery saver apps. I hope you get a chance to review the UX430UN and UX530UN. I'm interested to see if they maintain the good (for the size) battery life with the MX150 and DDR5 version of the 940MX. first of all great review! and i can't decide if i should buy this one or the asus zenbook ux430ua. 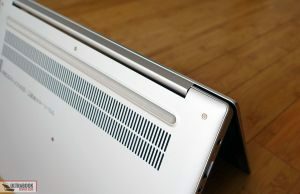 but then i read your review and now my main concern about the zenbook is the noisy fan. 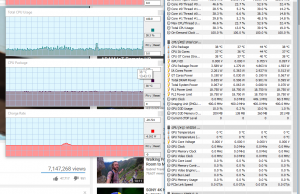 To be fair, the fan inside this IdeaPad is fairly noisy as well. In few words, the UX430UA is lighter, gets a nicer screen with a matte finishing and actually performs a little better in demanding loads. The Lenovo on the other hand gets TB3, a bigger battery and the 940MX GDDR5 graphics, but the TB3 and dedicated graphics won't probably do much for what you're saying you're expecting from your laptop. 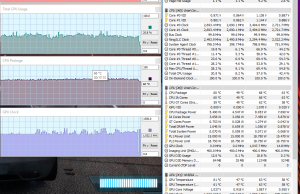 As an extra note, keep in mind I tested the UX430UQ version with the Nvidia graphics. 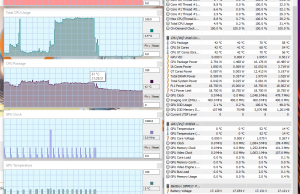 The UX430UA only gets Intel graphics and will run cooler (and quieter, to some extent). Thank you very much for this review. Right now I have Lenovo Ideapad 500S, i3 (14inch). And it's a good laptop. The only problem I had after using this laptop for about 3 months was the hinges! 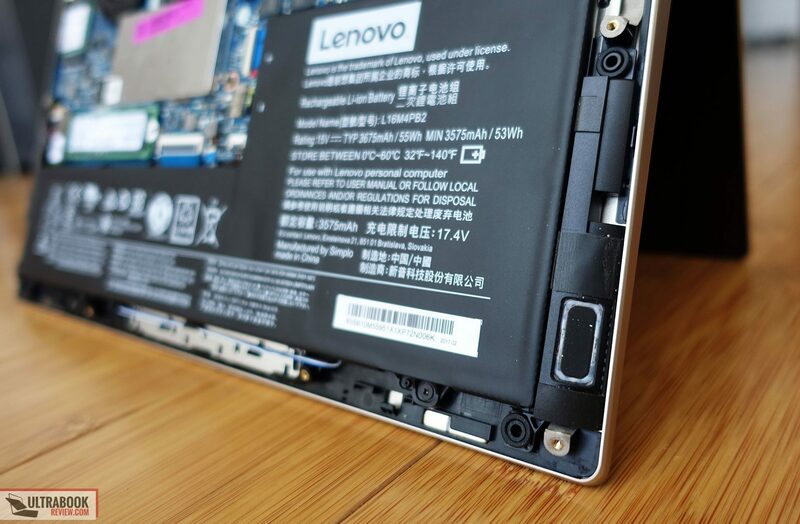 After 1,5 years Lenovo replaced the whole panel with hinges. I paid for that over 160 dollars. This is my second Ideapad laptop and the previous model also cracked after 20 months since I bought it! Are the hinges and the areas near the hinges well built in 720S? Any unnecessary spaces there? HI, the build quality seemed fine for me, BUT, bit BUT, I can't actually judge reliability based on using the laptop for a week or two. I also didn't open the plastic shell of the hinge to see how it's designed inside. So bottom point, I really can't tell for sure if this is built better than your older devices and whether it will age well or not. I understand. Thank you for your quick reply. Hey Andrei, great write up! I've been in the market for a good ultrabook for some time and your reviews are always great. I'm fairly sold on this model as of now, but I have a quick question regarding the GPU since it seems like you're really advocating for the MX150 over the 940MX. 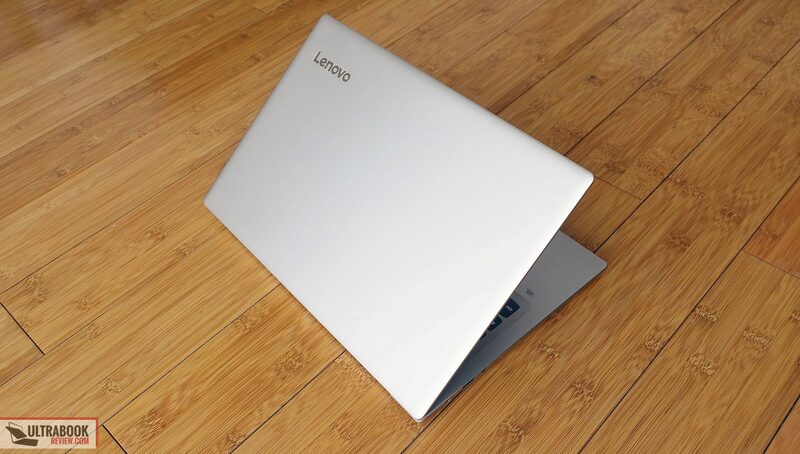 Currently, Lenovo's website has a deal on this specific model for $750, which IMO is a pretty great deal. I saw another person comment on the availability of the MX150 in a new model 81BD000TUS, and looked it up, turns out it also comes with the new i5-8250U. It's available through Amazon (no reviews) for a ~$200 increase at ~$950. To get to the point, do you think the performance of the MX150, along with the 8th gen i5, is worth the extra $200 price tag here? 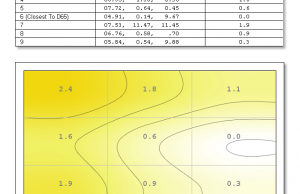 I'm primarily getting the laptop for school, which occasionally requires the use of CAD software such as Solidworks. I'd also like to get some light gaming use out of this purchase. I'd say yes if you plan to keep the laptop for a few years. The i5-8250U is quad-core and offers a significant boost in performance in multi-core loads, and the MX150 is significantly faster than the 940MX as well. I see that the Acer SF314-52G-55WQ has the i5-8250U as well as the MX150, but no Thunderbolt 3, for ~$750. I know you didn't review those exact models, but which did you prefer? For $200, the addition of Thunderbolt 3 seems like a lot. I've owned a Lenovo for the last 5 years and the build quality has been great. I'm a bit weary of Acer products, but at a $200 discount I'm considering it. It's not just Thunderbolt, there's also the smaller footprint, nicer construction, better screen, larger battery. The Swift 3 is excellent for the money, but it cuts some corners to meet the lower price tag. Got it. Thanks for all the help! Thank you for your review. 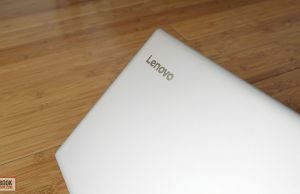 Yesterday I bought this laptop on Lenovo USA. 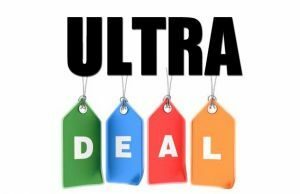 i7-7500U, 16Gb RAM, 512Gb SSD for $969. Lenovo claims to have up to 40Gbps on TB3 but as I read on your review this can be tricky… My question is: I plan to buy an eGPU (like Razer core or another) but if the TB3 port in this Lenovo is half cutted then. will the eGPU will work? The x2 is a bottleneck if you want to play games on the laptop's screen with the eGPU hooked up, but it's no issue at all if you also use an external monitor hooked up into the eGPU enclosure (Core or others). Thank you Andrei! What do you think about de <$1,000 deal for the i7, 16Gb RAM, 512 SSD? Very good. I'd reckon the Zenbook UX430 is more expensive? Extremely helpful review! Thank you! 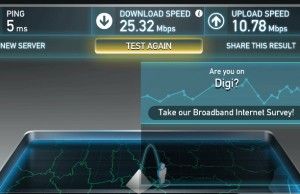 Just a question on the wifi card: how slow does the wireless get? I'm coming from a 2010 MacBook pro on which I've been running Linux for the past few months (an upgrade is very much overdue). 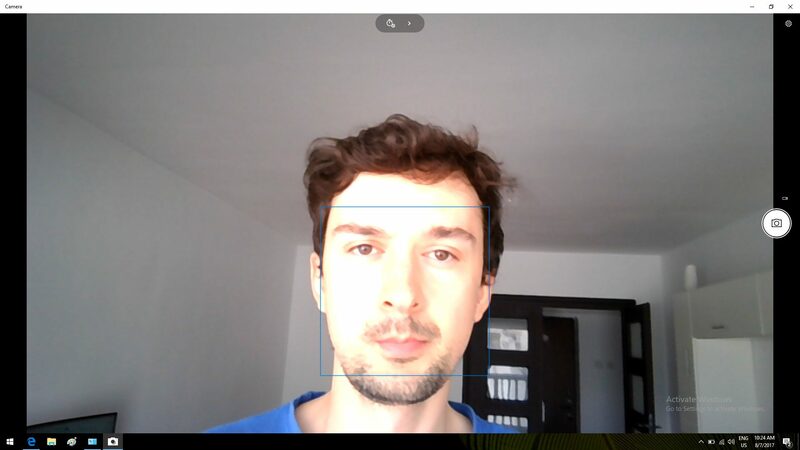 Is (1×1) enough of a setback for me to consider other options? Right now I can get this model with an i7, 16GB RAM and 512GB ssd for 1k on their website, which sounds like a decent deal for me. I just don't want the wireless to be painfully slow. 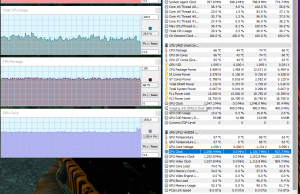 My unit was rather slow, averaging 45-50 Mbps on a 2.4 GHz network where other laptops could easily reach 100+. I'd further dig into this matter and perhaps find out if replacing the Wifi chip helps, or if others report better performance, as there's a chance things could have been improved with newer drivers. 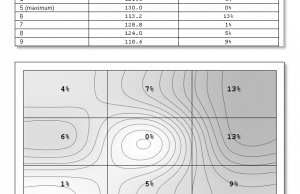 1×1 is unfortunately common and yet if you want good 2.4 speed its really not going to happen anyway and most users find 5Ghz a big issue with range. 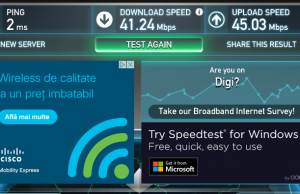 I can tell you a lot of PC makers skimp on Wifi and if you ever feel you may want something better. Get a 2×2 now because a 1×1 setup may not have duel antenna's and you won't be able to upgrade to 2×2 easily without adding another antenna. 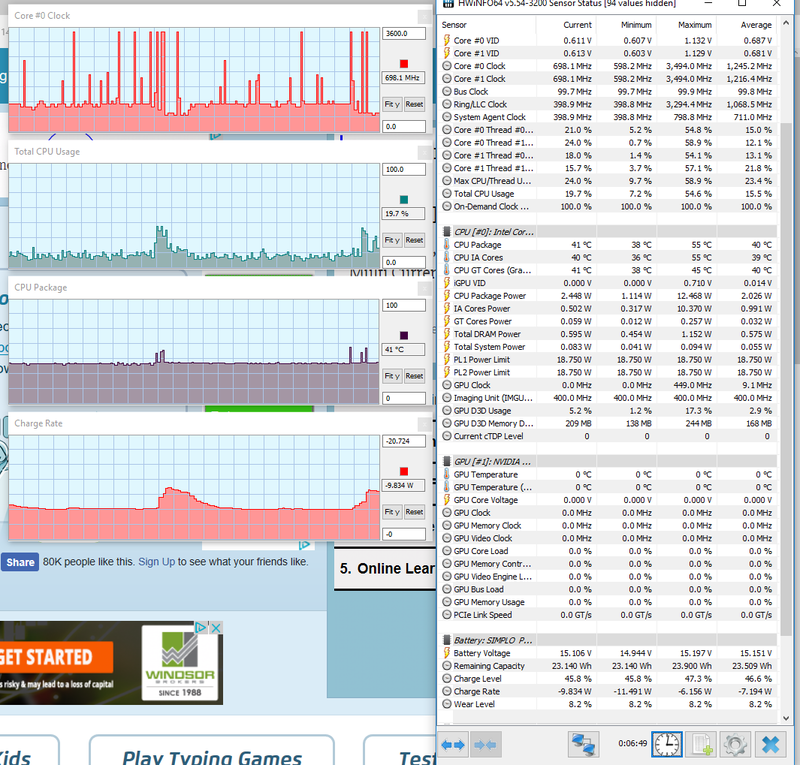 Frankly I wish PC makers put in better wifi something everyone uses then loading up with un needed RAM. 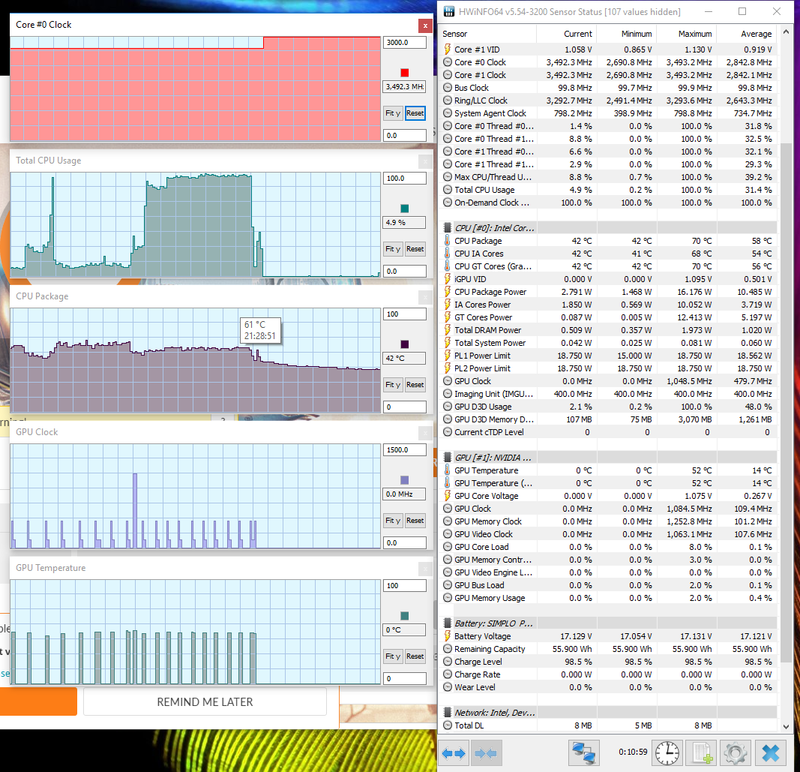 Most users don't need over 8 GB RAM anyway. It's just overkill. Hi. I'm considering buying the new model of this laptop that comes with i7-8550U + MX150 dGPU and currently available in the Lenovo US website at US$790 since Black Friday with corporate perks discount. Only issue seems to be that memory is 8 GB so assuming they're using the same chassis as 7th gen + 940MX, is the memory soldered or upgradable? I'm confused because from the disassembly photos I can see a silver metal cover above the M.2 SSD slot, which I assume means there's a non-soldered ram bracket. During my research I've also come across some unknown European maintenance manual of the previous gen 720s that showed a diagram of opening up that metal plate to remove the memory. Thanks. You want any kind of longevity in a laptop your going to have to spend $800 to a grand to get a good overall package. Anything under $500 is going to compromise in several areas, and your going to be replacing it sooner. 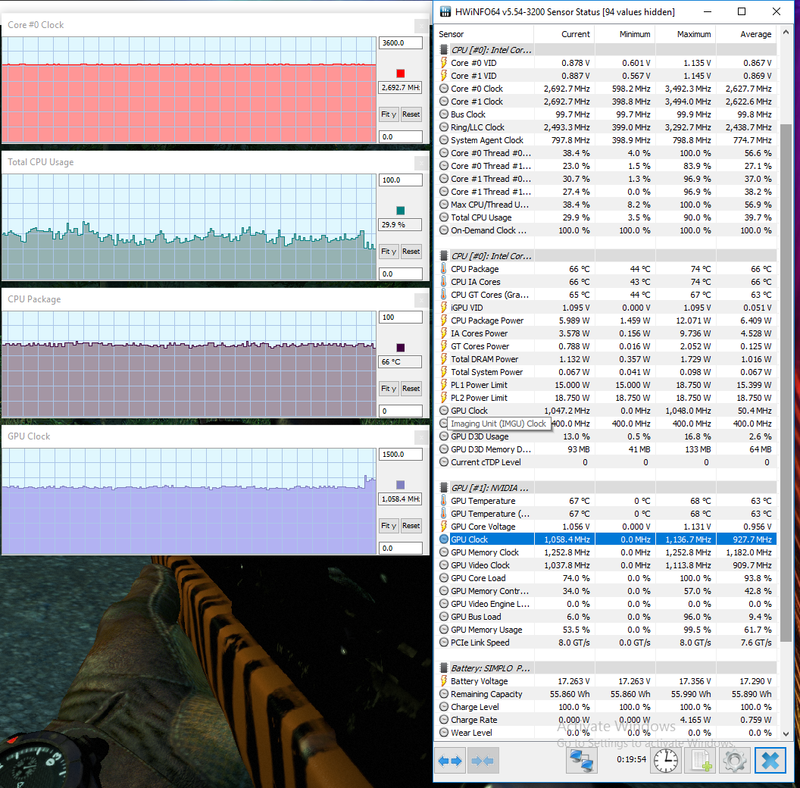 Especially with ultra low voltage CPU's a quad i5 or i7 is almost a requirement even for basic use these days. 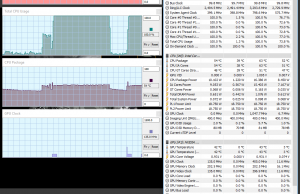 I have a 6th gen core i3 and its rather slow when you multi task at all. Then you have to have a IPS screen to get any sort of good viewing angle and HD or higher resolution. Can someone give some lights about the type-c port? I was looking for a hub (more usb ports, VGA, UHD4k, Ethernet, etc) but it seems like not all the hubs work with this kind of USB-C ports (specially if the say Thunderbolt). So Im asking if somenone with this laptop can obtain a described information about controller, version, specifications, etc. Lenovo has a trash client service and the forums are empty of answers. As far as I know, pretty much all hubs should work with this, as it gets a proper TB3 port. Do you have other reports? Its a little bit confusing. For example, for video output, the laptop needs to be compatible with DisplayPort Alt. Mode over USB-C Is this 720s model compatible with this? Is Dual video compatible? is Power Delivery (PD) compatible? Not all USB-C devices support PD. Hello (again), I need to decide between this and the Lenovo Yoga 720 (final decision). I'm a high school student by the way, and I was thinking that the Yoga 720's touchscreen and stylus support might come in handy when I'm taking notes or the like. So which one is better for my needs: Lenovo Ideapad 720S or the Yoga 720? Thanks in advance! HI. As you've probably hinted from my articles and replies, I can't make the decision for you, because you know best what you want in your laptop. 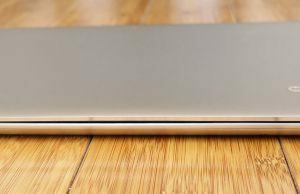 If you expect to put that touchscreen to good use, then go ahead and get the Yoga, it's a fairly solid notebook (there's a review here on the site). 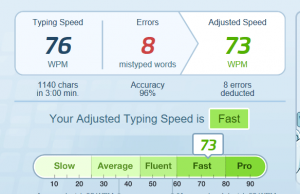 I think one aspect is whether you think you take better notes on a keyboard or in your own hand. Some people retain better when it's in their own hand. And of course, if you're doing math, science, or art type things, the stylus will make it much easier to draw figures and equations than to use an equation editor. Something other than hardware to consider. Thanks a lot for review on this laptop, very helpful indeed. However, i'm confused. 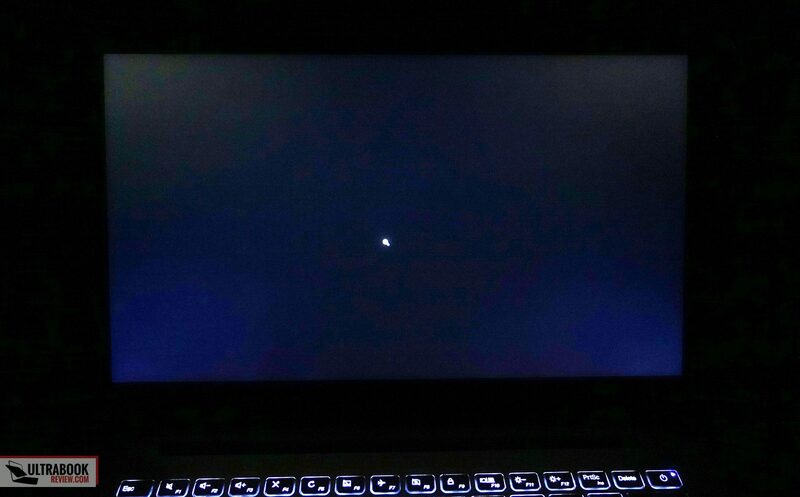 I recently bought this laptop but on the first day itself after few hours normal internet browsing & youtube videos usage, it started giving me that fan noise as you mentioned in the review (started making that noise and went silent). I even didn't put it under any load, didn't play any games. Actually, i'm not into gaming, i just need a laptop for general surfing and for coding languages. 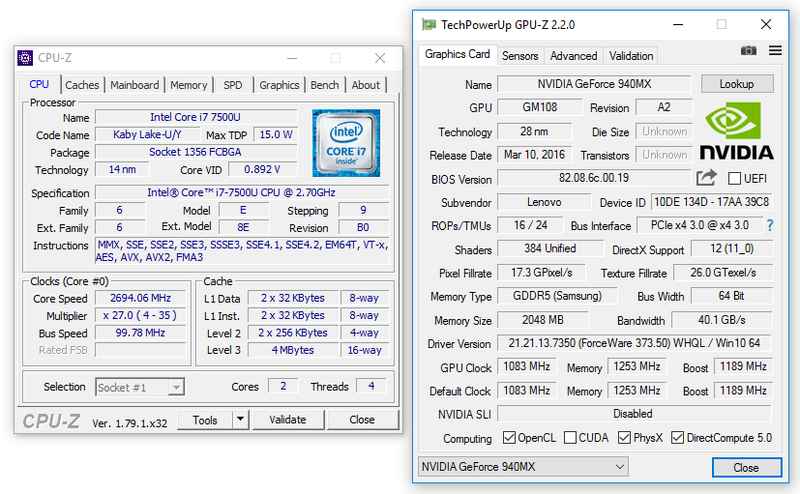 I bought i7 8th gen, 8Gb, 256 GB ssd with MX150 GPU and for me this is very good configuration at the price (CAD $1100) that i paid. 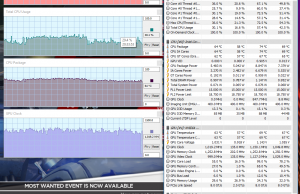 I'm not sure if that fan noise would go away in near future if there is any BIOS update or software update. 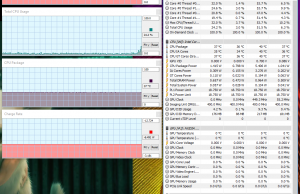 OR should i just ignore that fan noise as it happens intermittently. 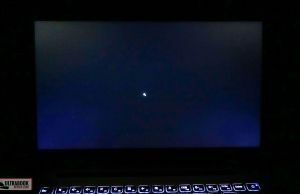 I would really appreciate if you can suggest me an alternative to this laptop. 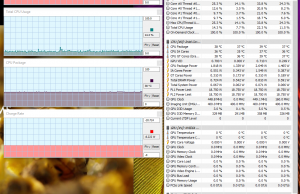 Well, most other similar laptops have fans that behave similarly. You should have checked for activity, a new product performs a lot of updates out of the box and perhaps that was driving the fan up. If there wasn't anything running in the back, well, then that's just it, you'd have to get used to the noise or go with a larger laptop. Do you plan to make a review of the new Ideapad 720s with the 1050ti 4G GPU? Can't tell, right now the local Lenovo agency doesn't have any new review units. 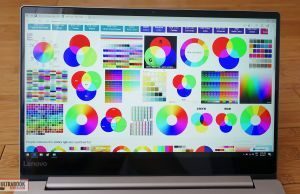 Nice review, I am looking for a laptop which is i7 processor and particularly 13 inches or 14 inches, I use it on daily basis being a developer. Can yo please suggest which one would be better either ASUS or ideapad? 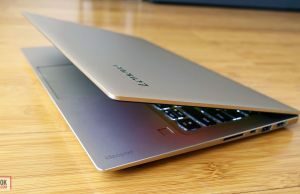 Now that there is an i5-8250 version with the MX150 GPU, is there a big difference between the IdeaPad 720s and the Zenbook UX430 (both i5-8250 and MX150)? Also, is the fan noise a deal-breaker? 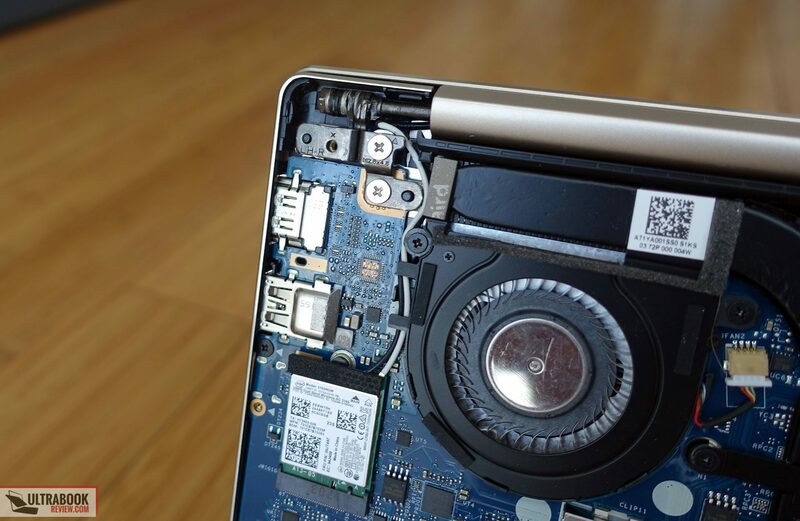 I was leaning towards the IdeaPad but I'm not so sure now because I've heard bad things about the fan noise. Noob question here. 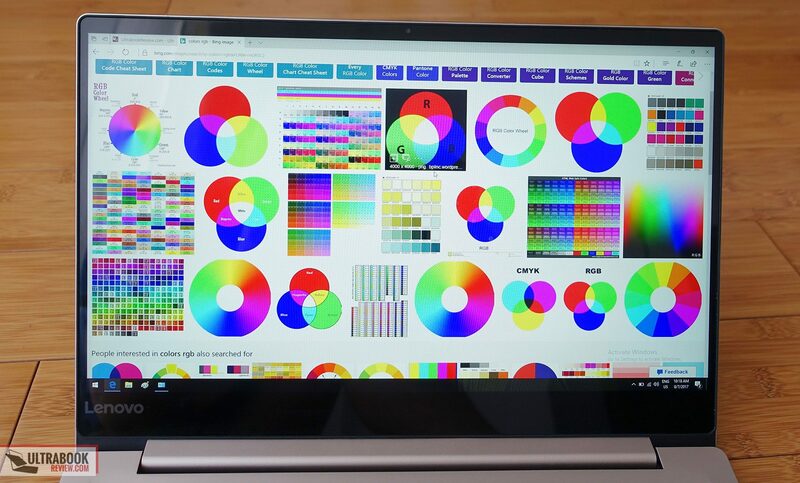 I just bought this laptop and I downloaded your calibrated color profile. How would I apply it? Do I just open file? I've bought the 720s (i7-8550u, mx150, 8gb ram, 512 ssd) a couple of weeks ago. Running PcMark 8 battery test show a much lower duration than your results. 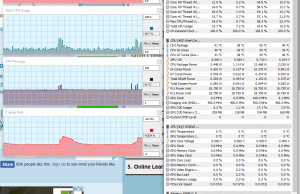 I suspect the laptop lasts at zero charge for several months, since the first time I turned it on the battery was at 0%. Could this cause the results to be so different? I scored 5h in home task, 6.5h in office task and about 7h of video loop. Do you think I should ask the seller a replace or these results are normal? I still have two weeks to ask a refunding or replacing. I would like to buy a new laptop for blogging, video editing and photo editing, and at the moment I have three options: HP Envy 13, Lenovo IdeaPad 720 S, and Asus VivoBook S13. Which one would you recommend? It would serve amateur purposes, not professional photo-video work. My budget is 1000 USD. I'd probably go with the HP if they're about the price, it has the better screen of the three (fairly bright and color accurate) and no significant quirks. 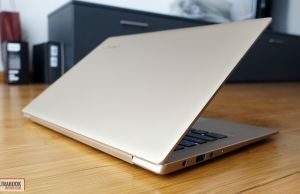 the Ideapad would be a second choice, and while the VivoBook is newer and I haven't yet reviewed it, I'm afraid it might come with a rather dim and washed out screen, as indicated by the screen choices of the other VivoBook S options (like the S530). I just ordered a 720s with these specs. I'm wondering if you know if the mx150 is the slower version or the faster one? Thanks!